Special offer valid with a minimum order Starter+Dish or Dish+Dessert (per person). You can eat what you want and enjoy your meal. The Special Offer is only valid “a la carte” and for the booked timeslot. Set menus and drinks are not included. Staff are kind, nice cooking, great restaurant! Two of us chose the Saumon d'écosse en bouillon thaï, légumes taillés et riz au citron confit but were a little disappointed - we anticipated that the bouillon would be clear - probably our mistake but the liquid had too much coconut milk in it and was short on flavour i.e. needed more coriander and something else to give it a bit of a lift - ginger? Also, for the first time, there was a problem with the bill which we paid cash but I did not get enough change back and only realised this when I got home. I went back to the restaurant and they realised there was a mistake and refunded me the missing amount. I hope this was a genuine mistake. Unfortunately, the welcome we received was very poor. The main dishes we chose were very good but the dessert was disappointing - the clafoutis was solid! food excellent, beautiful setting - we were seated on the terrace as it was a lovely sunny day with a wonderful view. The menu du jour was well balanced and delicious. However, the service was slow and although the waiters were charming they were not very efficient as there seemed to be confusion as to who should be doing what. food delicious - the operation was upside down today - not usually like that - maybe the start of the season... an apology would have been nice - but none offered - we cancelled the coffees as we ran out of time. I've been to this restaurant a number of times, especially in summer when to eat on the terrace is a real delight. The food is always 'correct' and sometimes very good - depends on the menu. Service is ok considering that they are all very young so don't have much experience - which is what makes really fine service. Two wines on the menu were not available... that’s disappointing. This time I was a little disappointed. The steak was a bit chewy - it came with 'mixed vegetables' which turned out to be one spoonful of courgette and something else. The fries were good. I ordered a glass of wine but after a while had to ask the waiter again. When the food arrived the steak was a bit tough and not really hot enough. I asked for steak knives but the one I got was not serrated which didn't make cutting any easier and I swapped with my friend. I guess the waiter pulled two knives out of the drawer without first checking if they were steak knives! Superb food, perfect ambiance, calm and gentle, and delightful attentive service. Nice dish out of the food. Nevertheless, the quality of the meal didn't reach the expectations. Cadre un peu vieillissant mais assez chaleureux. Service ok mais cuisine décevante. Lovely environment, good standard food (though limited menu) and reasonable prices. We were however disappointed by several failures in service - slow drinks, no drink service (i.e. Bottles on table no pouring), no bread until we asked, forgotten fries for one meal, dirty water carafe ... The staff were nice but overly worked/busy or not well trained. Worst point was being served a tasteless lactose free pannacotta dessert when we asked for gluten free ... ! 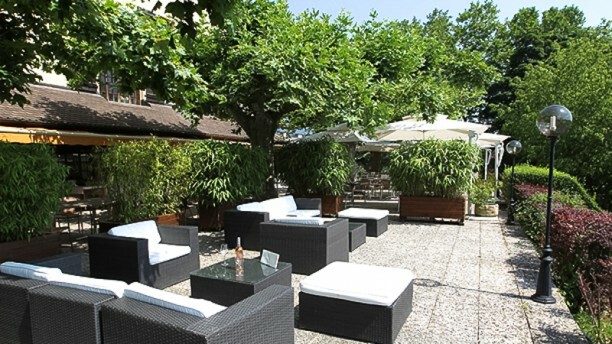 We would however come again - especially to enjoy the beautiful terrace!